Drew will be the special guest at the Street Vibes Music Fest. 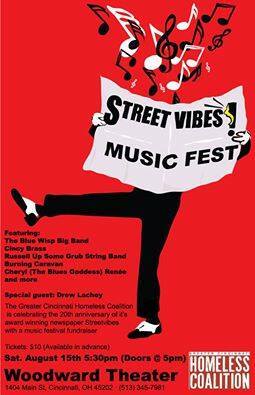 The Greater Cincinnati Homeless Coalition is celebrating its newspaper, “Street Vibes” 20th birthday with this fun musical fundraiser. “Street Vibes” is a alternative newspaper focusing on homelessness and social justice issues. It is published twice a month and sold primarily on the streets of Cincinnati by individuals experiencing homelessness or poverty. Its editor is none other than Justin Jeffre. The Street Vibes Music Fest is August 15, 2015 at 5:30PM (doors at 5PM) at the Woodward Theater on Main Street in Over the Rhine. This entry was posted on July 31, 2015 by emmieleigh. It was filed under appearances and was tagged with Cincinnati, Cincy, concert, Drew Lachey, Greater Cincinnati Coalition for the Homeless, Greater Cincinnati Homeless Coalition, Justin Jeffre, Music, Music Fest, OTR, Street Vibes, Things to Do in Cincy, This Is OTR, Woodward Theater.